I remember my Mother and her friends called a recipe like this a One Dish Dinner and today we call it a One Pot Meal. It is really great to have a go to recipe for a very busy day when there is no extra time to be spent in the kitchen. This One Pot Meal, uses fresh vegetables right out of the garden or the farmers market. A harvest in the pot, add some chicken, and this is a fabulous One Pot Meal in less than one hour. This is one of our new recipes from Garden to Table, and sure hope you enjoy it as much as we have! Wash the chicken and cut into 2 inch pieces, then generously salt and pepper the chicken on all sides. Pour the olive oil into a large heavy pot and quickly brown the chicken, reduce the heat, cover and cook for 10 minutes. Remove the cover and stir the chicken. Add the,onions, garlic, and bell peppers. Cook the mix until the onions are clear, making sure to stir constantly. Add the tomatoes and cook until the tomatoes begin to burst, making sure to stir constantly to keep the dish from sticking to the bottom of the pot. Add the zucchini and olives. Stir into the chicken and vegetable mix. Add the salt, pepper, oregano, dried basil, dried parsley and pepper flakes. Quickly add 1 cup of water. Stir the mix together making sure to get all the goodness off of the bottom of the pot. Cover the pot and reduce the heat to low, cook for 10 minutes. Add 5 cups of cooked pasta. The pasta needs to be warm when added to the mix. Stir in the pasta so that all the ingredients are incorporated. Add the cheese and half and half. Stir together. Cover the dish and keep warm until ready to serve. Thanks so much for spending time with us in the kitchen today, it is always great to spend time with a friend. This One Pot Garden Pasta with Chicken is a great meal that we really enjoyed and will be our new busy day dish. Hope you have a fun week and come back to see us real soon! This looks super yummy! 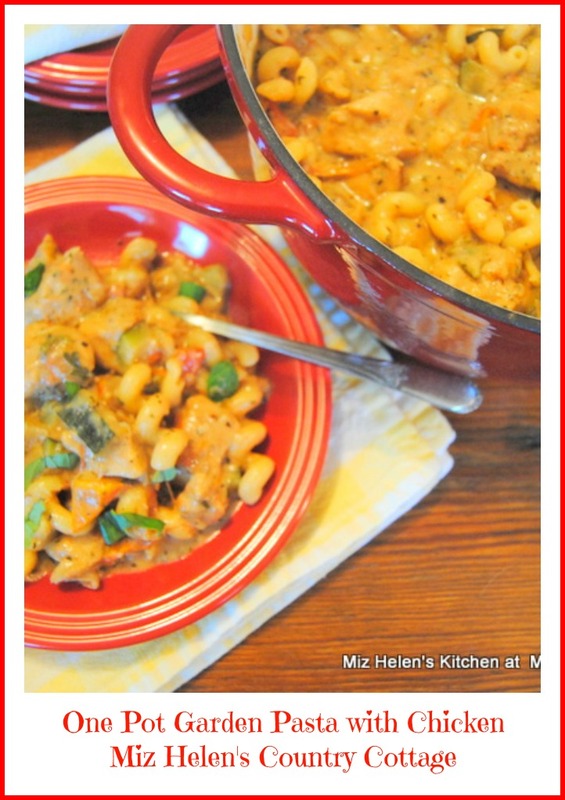 It's perfect for a fast weeknight dinner which always sounds awesome in my book. Thanks for sharing your recipe with us at Merry Monday this week!